"Shelob does not attack everyone venturing into her lair, for if she did, no sane and fresh beings would come. She exacts her ghastly toll on perhaps a quarter of those merely passing through; of course, the longer one roams Torech Ungol scooping up treasures, the more likely is a disastrous encounter with Her Ladyship." This is a lesson killer dungeon masters like myself needed to heed more often: sometimes the best approach is messing with PCs' minds and allowing them to loot unscathed. For one, they won't believe their luck and be constantly on guard against the worst; two, it pays off in future encounters when they do let their guard down. Shelob's lair pays dividends even when her majesty stays off-stage: there are hatcheries swarming with young spiderlings, refuse pits more nauseating than a Siberian toilet, and larders where live prey are suspended upside down from the ceiling. Half of these victims are just as well destined for spider feed (the orcs and trolls), and all are 80% likely to be awake, accentuating the horror of the place. It's one of those rare dungeons where a tense monstrous presence is felt at all times, however real or imagined. Anyone sauntering into Shelob's Pit itself, however, is in for the reality of pure hell. It's a 500-foot diameter cavity ringed by a narrow ledge, which her majesty will do her utmost to knock intruders off, and send them bouncing down a quarter-of-a-mile slope to the center of the floor. Where lies "a mass of bones, possessions, rotting flesh and filth so vile as to stagger the imagination and send anyone with a constitution less than 90 [15 in D&D] into a fit of violent retching", treasure exceeding 50,000 gp, and a number of powerful magic weapons. All of this (naturally) has a 50% chance of contracting looters with a fatal disease, assuming they can even escape, which is terribly unlikely given the 85% likelihood of Shelob being found here. The rest of the architecture delivers as it should: the Tower of Cirith Ungol with its eleven levels, and two orc dens in the Morgai Vale. The tower is held by Gondor in the module's time frame (1640), and unlike Minas Ithil, on which such a period was criminally wasted, here it's ideal. 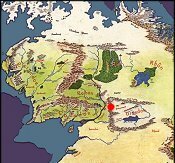 It's classic Keep on the Borderlands, in fact, with the lone bastion of Cirith Ungol raising a precarious fist against enemy incursions from Mordor. A Gondorian tower between two orc holds offers more potential than an orc tower between two orc holds, and of course Shelob doesn't distinguish between either side. But for those running campaigns post-2000, the tower is easy enough to convert by substituting Gondor soldiers with orc. 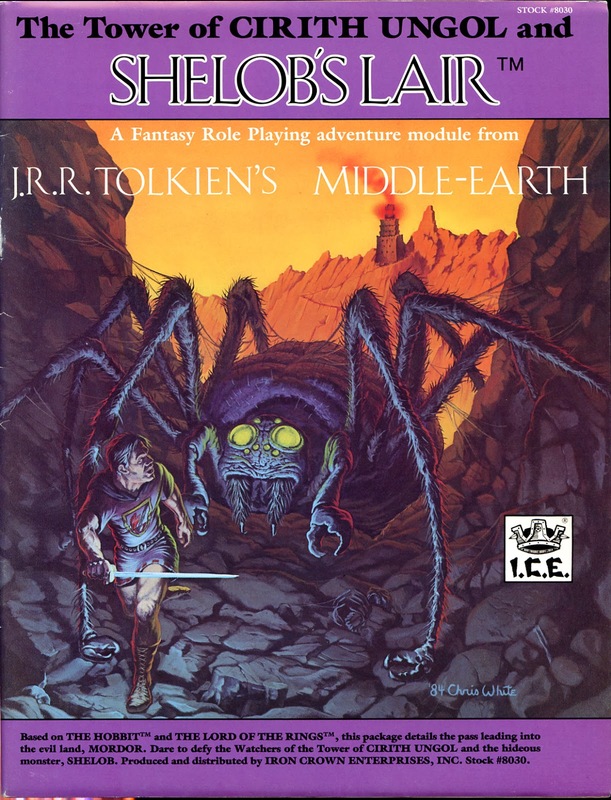 Shelob's Lair was one of ICE's earliest modules and shows the influence of early TSR adventures. I had loads of fun running it against members of a college gaming club... and her majesty, it turns out, never had to make an appearance. 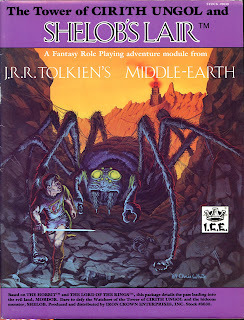 I find it ironic that you say, "Shelob's Lair was one of ICE's earliest modules and shows the influence of early TSR adventures." since this one of all their modules feels the least "gamey" to me and stayed true to the source, by not making Shelob an active monster the heroes hunt down. I did like this module though, it's one of my favorites. I even built a styrofoam model of Cirith Ungol to 25mm scale of the first 3 levels when I was 16. Wow, really? This one and Bree and the Barrow-Downs (and Goblin-Gate, closely) are the adventure modules that just shout old-school D&D to me, but I again emphasize the powerful set-up so reminiscent of Keep on the Borderlands. How close the module stays to its source material doesn't have any bearing on the question, though I agree this one is quite faithful.